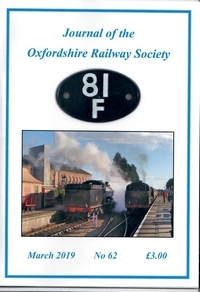 Oxfordshire Railway Society pubishes an annual journal - 81F (named after the Oxford railway shed in the days of steam). 81F is now printed partly in colour, and contains a wide variety of articles written by ORS members, plus the occasional item from a guest writer, and photos which include the photographic competition winners. It is available from the.oxfordshire.railway.society@googlemail.com for the price of £3 (plus £1 p&p within the UK). If joining the Oxfordshire Railway Society, a complimentary copy of the current issue is provided as part of the membership fee. For details about joining the ORS click here. You can view articles from the 2006 edition of ORS Journal 81F by clicking here.